This set of four horseshoe coasters have a non-skid leather-look neoprene "pad" inside each one to protect your furniture against sweating glasses. The "corral" they come with is just that - a wood-look resin corral with a western saddle and cowboy hat thrown in for good measure. The coasters measure 4 1/2" wide x 5" long. So, for as long as I can remember, I have championed products that LOOK LIKE they're made with repurposed horseshoes but instead are commercially produced. I am a pretty tough sell as far as accuracy goes, and these coasters certainly pass with flying colors. 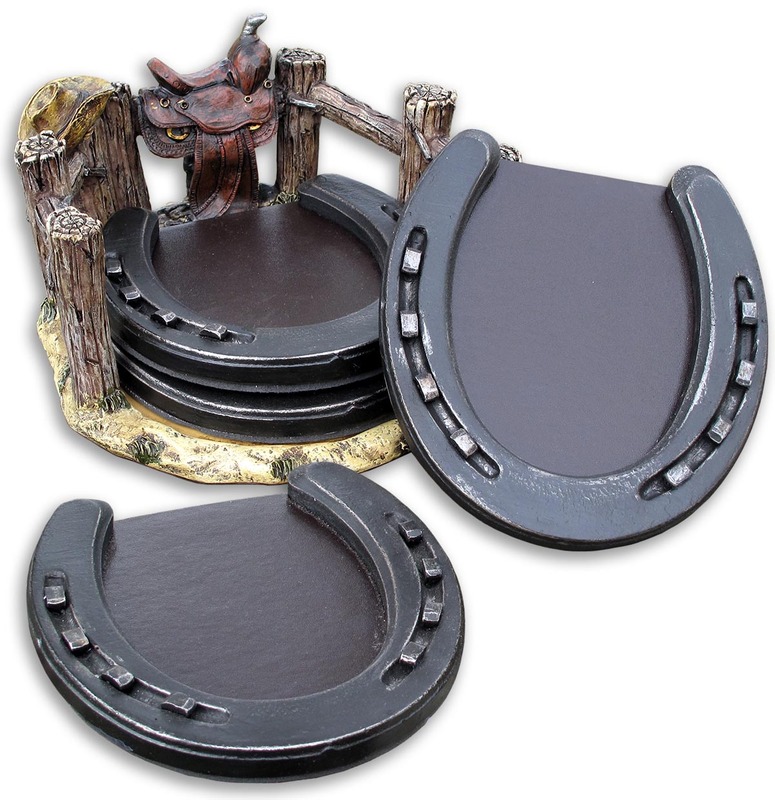 This set of four horseshoe coasters have a non-skid leather-look neoprene "pad" inside each one to protect your furniture against sweating glasses. The "corral" they come with is just that - a wood-look resin corral with a detailed western saddle and cowboy hat thrown in for good measure - you can zoom in and see here. They're made of resin, so they're not heavy, they won't rust, and they can be cleaned with soap and water if need be. No farriers were harmed in the making of these coasters.